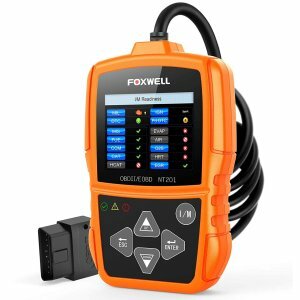 Amazon.com offers the FOXWELL Orange NT201 Auto OBD2 Scanner for $28.57 via coupon code 10MMMM10 . Features: FOXWELL NT201 bi-directional vehicle check engine code reader will work on domestic and import vehicle, such as light-duty trucks (12v only), SUVs and mini-vans with standard OBD2/EOBD/JOBD&CAN protocol. European vehicles from 2000, American ones from 1996, and Asian from 2008. TIPS: The odb2 scanner isn't compatible with hybrid or electric cars.